A car driving on a section of Interstate 5 just north of Los Angeles struck a mountain lion named P-32 one early morning this past summer. The cat was once of a small population that has been tracked roaming Southern California wilderness areas. The death, while reported as “sad, but unsurprising,” drew attention to the close proximity of these animals. Our transportation and urban infrastructures draw unnatural lines through their natural habitats. 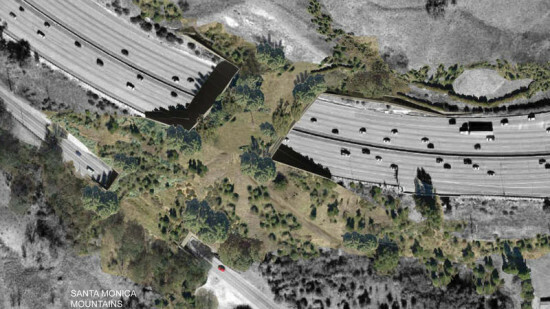 https://youtu.be/TDRvTdOrYsk Earlier this month Caltrans released a proposal for a landscaped bridge across the 101 Freeway. 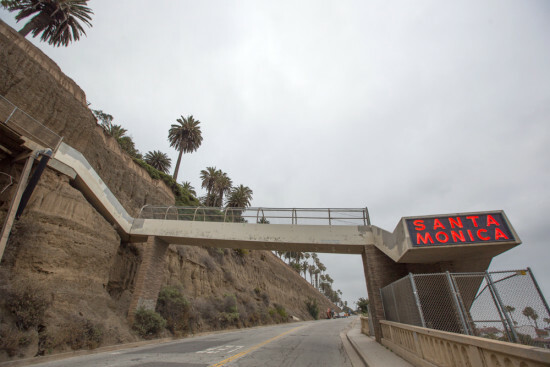 A 165-foot-wide, 200-foot-long overpass would provide safe passage for wildlife from the Santa Monica Mountains to the Simi Hills and Santa Susana Mountains, an area that has seen rapid development in recent decades. According to the Liberty Canyon Wildlife Crossing project study report, biologists National Park Service have counted a dozen mountain lion deaths in the area since 2002. The wildlife crossing is an ambitious piece of infrastructure. Not only does it have to span 10 lanes of traffic, the bridge needs to be amenable to the pumas, foxes, bobcats, and coyotes it wants to serve. As such, the more than $30 million dollar bridge would be landscaped with native, drought-tolerant vegetation mimics the natural habitat. Barriers would muffle noise and block bright headlights. The released project study report was funded by a $1 million grant by the State Coastal Conservancy. An additional $3 million is being sought to continue the development of the final design plans. You may have heard that the San Francisco-Oakland Bay Bridge is being replaced. 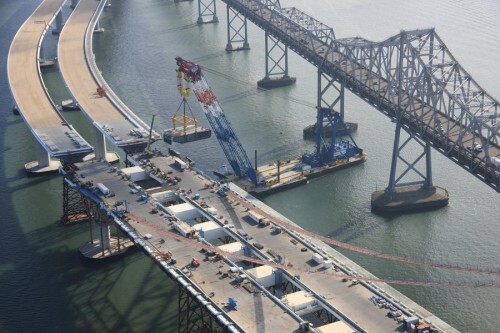 (Technically the west span is being retrofitted and the east span is being replaced.) But the $6.3 billion project, which has been underway since 2002, has hit a snag: We learn via the Sacramento Bee that the California Department of Transportation (Caltrans) has fired two employees after a Bee investigation showed that the technician responsible for testing the new bridge foundation's structural integrity falsified and fabricated test results on other projects. The two fired were: Duane Wiles,who tested foundations for bridges and other freeway structures and Brian Liebich, who supervised Wiles as chief of the agency's Foundation Testing Branch. The Bee's investigation examined about 50,000 internal Caltrans reports and test data documents and reported that Caltrans officials knew about the problems for years, but never conducted a serious investigation. Oops. The new bridge is expected to open to the public by 2013. Hopefully. California State Route 75 is getting a whole lot snazzier. 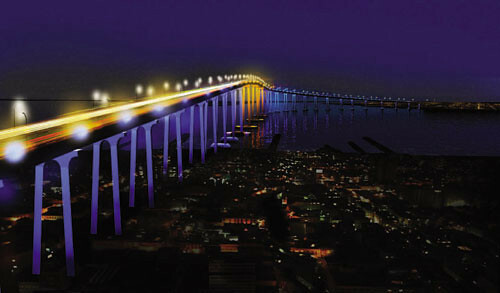 The 2.5-mile-long San Diego–Coronado Bay Bridge is set to undergo the “largest interactive green energy lighting project in North America.” An international team led by London-based artist Peter Fink (FoRM Associates) and lighting designer Mark Major (Speirs + Major) plus the LA-based office of engineering consultant Buro Happold have won a worldwide contest to illuminate the iconic, swooping girder bridge, opened in 1969. The team’s design incorporates energy-neutral LED lighting powered by wind turbines. The lighting will respond to the rate and intensity of automobile traffic on the bridge, as well as major boat traffic across its 1,880-foot shipping channel, and aims to emphasize the San Diego–Coronado Bay Bridge’s importance as a gateway between communities. The Port of San Diego and the California Department of Transportation chose the team’s scheme over two other finalists, including the French lighting design firm Bideau Company and a proposal from environmental artist Ned Kahn and Patrick McInerney Architects with engineering consultants Arup. Bideau Company, which has lit the Eiffel Tower and the Acropolis, proposed a moving zig-zag LED pattern projected along the length of the bridge, loosely based on designs found on pottery by the Kumeyaay Indian tribe. Ned Kahn/Patrick McInerney Architects with Arup proposed a series of clever wind and light sculptures situated in the void of each of the bridge’s inverted V-shaped girders. 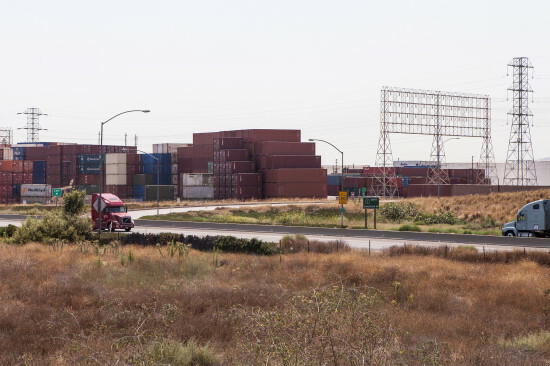 Check out videos for all three submissions courtesy the Port of San Diego. Widely accepted as the greatest public radio station on the planet, KCRW is famous for its groundbreaking music played by DJs who are smarter, cooler and infinitely better dressers than you. But last week was a bitter one for LA as the station's great Nic Harcourt hung up his headphones as music director. For those of you who are already missing Harcourt's esoteric taste (sometimes a bit difficult to take at 9:03am even after a visit to Intelligensia), never fear: Thom Mayne has stepped into the booth. You heard that right: As part of KCRW's Guest DJ Project, Mayne picked five songs that have inspired him throughout his life. Paired with former music director Tom Schnabel, Mayne sported his usual maniacal grin and a gleam in his eye (above) as he took to the turntable, admitting that on some occasions, he allowed music to help him design: "There’s actually times when I was drawing, closing my eyes, when I have a sketch book where I was moving my hand rhythmically and shaping it and literally trying to shape drawings that were coming directly from various types of music." You can hear the whole set at KCRW.com, but go ahead and rev up your iPod now, because here's what he played: 1.) Dr. John - Right Place, Wrong Time 2.) John Lurie (as Marvin Pontiac) - Runnin' Round 3.) Stevie Ray Vaughn - Texas Flood 4.) Laurie Anderson - Big Science 5.) Prince - Musicology We have to admit we love Mayne's taste in music, which left a dirty Texas BBQ flavor with a sprinkle of bad 80's hair in our mouths. And at least now we can forgive Mayne for the shortcomings of the Caltrans Building: It's clearly not his fault, seeing as he designed it while under the influence of what is easily the worst Prince song in existence. With the possible exception of "Diamonds and Pearls."